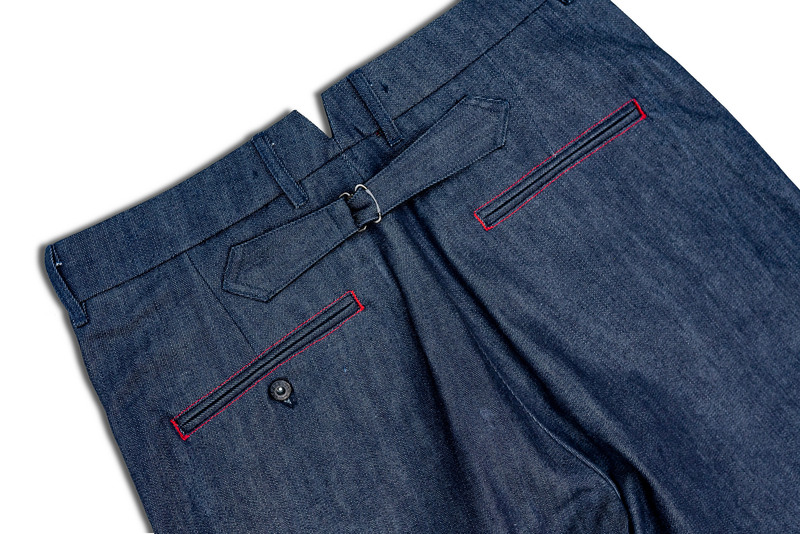 Easily the most comfortable pair of denim chinos SJC has ever made and with a ton of features: cinch buckle back, suspender buttons, black enamel donut buttons, red top stitching on pockets, lined waistband and deep pocket bags. It is the drape which you guys want. 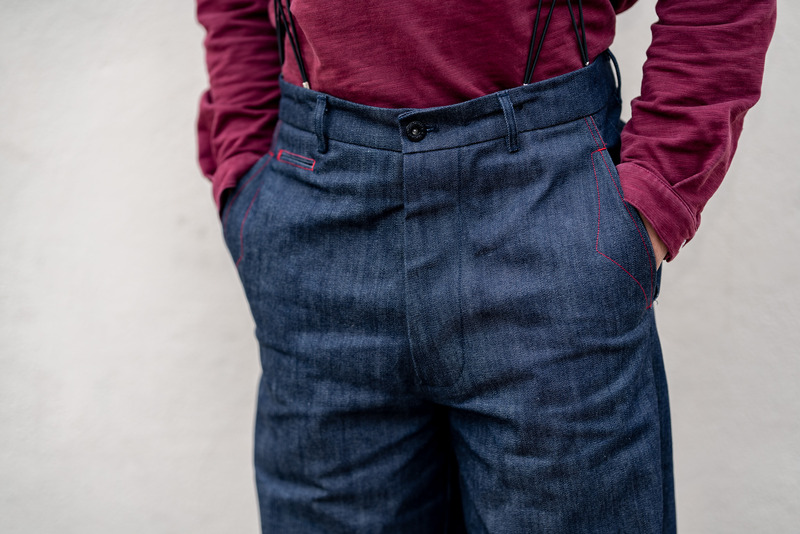 High rise and wide 11" hem to create a true full cut work pant. Ive widened the thigh to give that fullness you want but kept the seat under control. 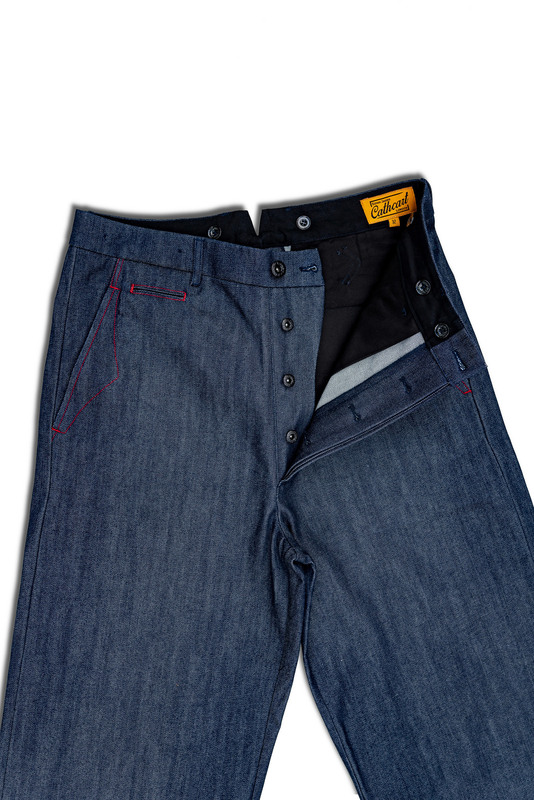 Crafted from substantial 14oz shuttle loom sanforized selvedge denim (so no shrink) you get a real pair of work pants. 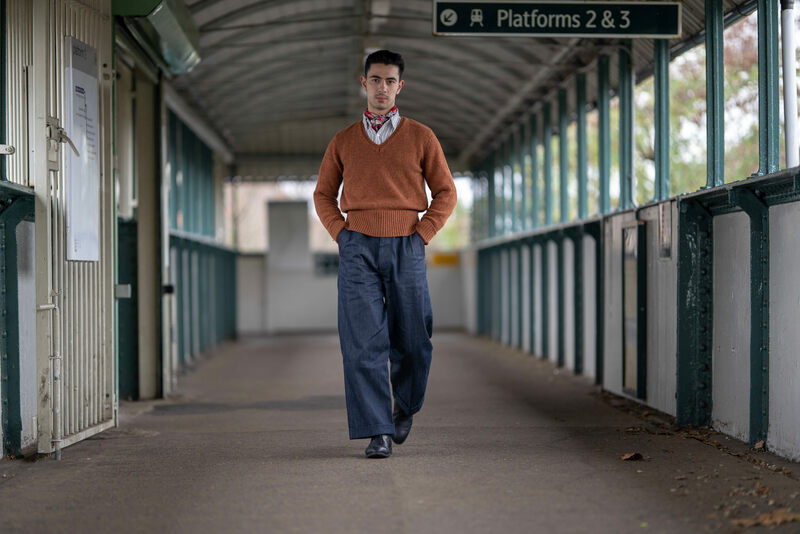 You will love this fit and being chinos they can be paired with just about anything up top from the 33 jacket and rust v neck. In stock now, and shipping worldwide. Goes live tomorrow. They look incredible. That's the cut that I love. The 33 jacket in the profile shot, showing the position of the backbelt and the back length very well, looks perfectly proportioned, unlike the back shot of Jamie in the shop where there is a discrepancy between the back length as listed (around 24" for a small size) and the look of the belted back in the photos (since a 24" beltback has a pretty fixed appearance). In other words the jacket is proportioned like a 20-21" beltback in the shop photos but the size charts suggests 24". I'm confident that the final product is indeed the one seen above, a 24"-ish beltback. But I suggest making this clear to customers by using photos of the appropriate final garment. Please use the new pics for the 33! Is my hunch correct at all? And I'm aware that the jacket in the shop pics is longer than 20/21". It's the proportions of the backbelt that I was referring to. Lovely. 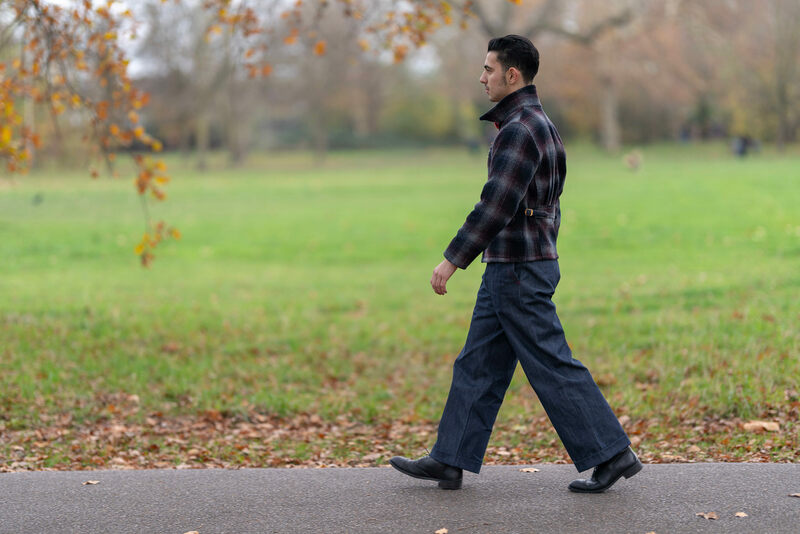 However, I would recommend that, on the shop and in your advertising, you should also use photographs showing the jeans rolled up, rather than hemmed with turn ups. It is best to let people see both versions. Some people might be put off by seeing PTUs. (11-26-2018, 06:43 PM)Sean Longden Wrote: Lovely. 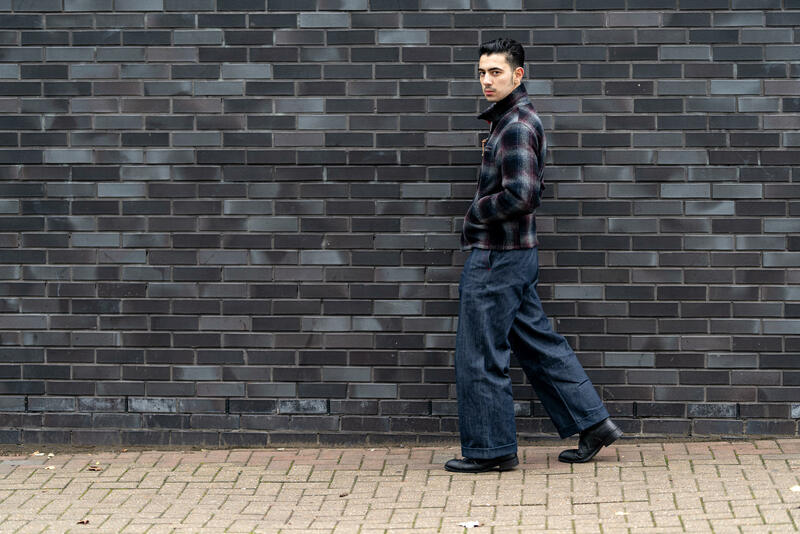 However, I would recommend that, on the shop and in your advertising, you should also use photographs showing the jeans rolled up, rather than hemmed with turn ups. It is best to let people see both versions. Some people might be put off by seeing PTUs. But not literally rolled up, please. Cuffed up once, raw denim style. A lot of denim heads are allergic to a cuff roll. Correct Nik. Thanks. I'll reshoot the pack shot. Yes, thanks Sean, ill mention they come un-hemmed. (11-26-2018, 07:22 PM)SJC Wrote: Correct Nik. Thanks. I'll reshoot the pack shot. Yes, please remove conflicting information, incl. the back shot of Jamie. (11-26-2018, 07:23 PM)SJC Wrote: Yes, thanks Sean, ill mention they come un-hemmed. Unhemmed? Denim heads would clearly prefer a chain stitch hem, the usual thing with jeans. They are as normal denim. I just happen to like hems on chinos. No they are just finished, i think with a blind-stitch, ready for hemming to one's required length. Then they're not hemmed like raw denim usually is (and like the last raw denim Big Bs were). The chain stitch is something that your local alteration tailor can't do. They don't have the hardware. 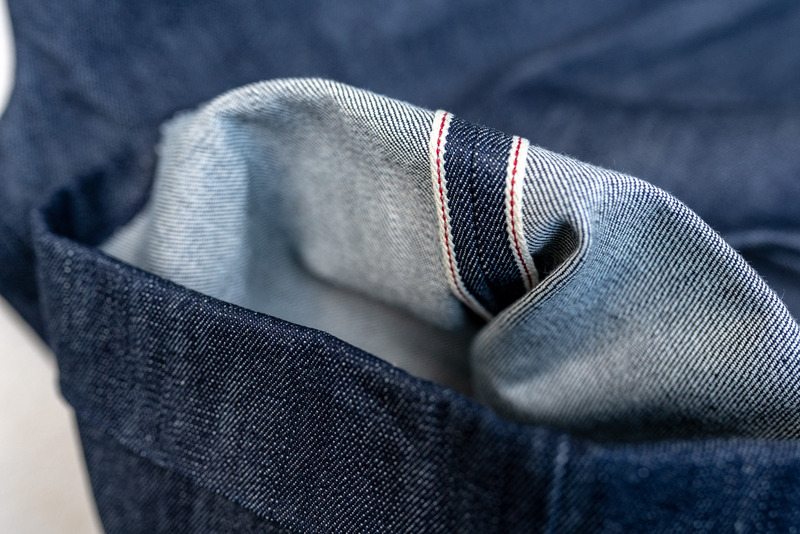 The thing is, I believe most denim enthusiasts will expect raw denim to have a 36" inseam with chain stitch hem, to be folded back once, no alteration, no tailored cuff. Nothing wrong with offering it differently, but be clear about it. So the denim crowd like them with a 4" or 5" single turn-up you mean? Interesting. I much prefer a double roll at aroun 2-2.5" myself, but it makes sense to run with what sells to the crowd. I'll be buying these for sure. I agree with Edward, the cut looks so good, wouldn't it be good to try other hard wearing fabrics? ?